How are you guys doing this week? Comment down below with how you’ve been and what you’ve been up to this weekend. You know I’m always nosey, and want to hear about what you’re up to. Throughout the year, I try to give myself style challenges such as this to keep me on styling my toes, and as you probably know, neutrals are not my most worn shades. In fact, you probably haven’t seen me in such a neutral look since about the summer of 2017. That’s when my love of colour seemed to blossom, but here I am. Back to black and trying to make it an important shade in my wardrobe again. For this more neutral look, I wanted to take the focus off color for once and instead use texture, pattern, and embellishment to still create an interesting look. I think keeping things like texture and pattern in mind when styling a neutral look is important and gives a more sophisticated and thought out approach rather than just plain black on plain black. Also think about the shapes and silhouettes you’re creating more with a neutral look. With this outfit I wanted a drawn in waist and a strong shoulder. I always get very Scandinavian vibes from the beading a color of this top. My key pieces within this look are definitely the beaded, plaid shirt and my patent trench coat. I wanted a fairly neutral pattern and I’ve been so obsessed with plaid/tartan for months now, so this top seamed like the perfect way forward! I also love the beading down the front that adds extra interest. 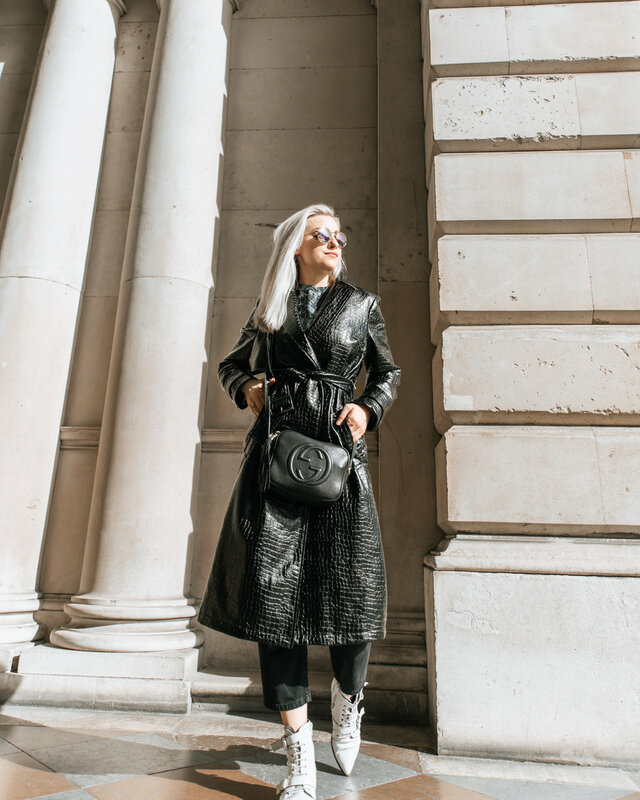 This show stopping trench is a second-hand piece I’ve been rocking non-stop recently! You can’t really go wrong with a trench coat in spring, and this one is so different and eye catching even though it’s black. To go with those key pieces, I decided on a pair of straight, cropped jeans from Topshop. I think the straight leg is a very modern jeans style at the moment. I also threw on my pointed white boots to tie in the white of the plaid and finished off with my black Gucci bag. Anyway, I think this is a color palette many of you will already be really comfortable with and if you think about elements like texture and pattern within the look, you’ll be well on your way to become a stylist, yourself! Comment down below with your favorite item from this look. A special thanks goes to Lucy for taking these gorg photos for me again! She’s such a lovely human and a talented photographer too! Remember to check out my Instagram for daily updates and adventures around London. Also, check back next week for a new post!